The Tennessee State Capitol building in Nashville. 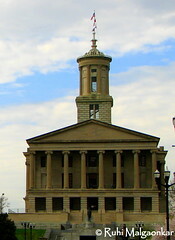 It is the home of the Tennessee legislature, and the location for the governor’s office. This architectural master piece is classic model of Greek lonic temple.